As the second biggest segment of the Czech economy, tourism continues to attract record numbers. While this is good news, quality is becoming a more significant factor than quantity, a trend reflected in efforts by tourism organizations to attract high-spending corporate and convention travelers. TOURISM NUMBERS grew in the Czech Republic with 7.7 million foreign visitors spending upward of CZK 110 billion in 2004. Ruzyně Airport, as well, saw a record number of passengers (9.7 million) pass through its gates last year. Increasingly, more value-added business and convention travelers are coming, being helped by the number of international firms moving large-scale operations here, even as companies hold tight reins on their travel budgets. However, while businesses and organizations connected to tourism admit Prague has seen a terrific year – which should continue – they’re quick to add there’s still a lot of work ahead, with some experts determining the city and country are only fulfilling half their potential, especially in lucrative convention tourism. ” The hotel industry has been good in 2004 and will continue to be in 2005,” affirms Willy Ribbe, general manager of the Marriott and Renaissance hotels. The reasons for the good year are hard to pinpoint. EU entry last May was expected to increase travel, but the question is how much. 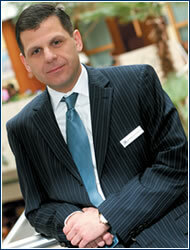 “EU entry has helped,” admits Markus Platzer, the resident manager at InterContinental Hotel. Platzer points to the visa restriction for Canadians being dropped after May as one example. He’s also seen more diplomatic travel, which is reflected in Czech Airlines (ČSA) plan to add a third daily flight between Prague and Brussels. “There’s much higher demand [on this route],” says Jiří Pos, vice-president of ground operations at the airline. EU entry has also helped raise the country’s profile and (almost) fully connect it to the Union. 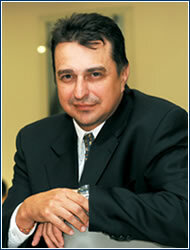 “Some invisible borders have disappeared,” says Armin Zerunyan, Hilton Hotel’s general manager. The thing really driving corporate travel and making Prague a key area to hold regional meetings is foreign investment and the expansion of regional headquarters. Says Pasquale Baiguera, general manager at the Radisson SAS Alcron: “Prague is in the center of Europe, so with more headquarters here, they’ll definitely have more regional meetings.” Increased investment and expansion also bodes well for extended-stay residences. Ribbe says interest in this service is growing. Accordingly, Marriott has developed its Longin Center of executive apartments offering hotel-like amenities. In addition to clients who come on business related to the film industry, Ribbe says executives on long-term projects or who are relocating fill most of the suites. Hotels are also faced with accommodating increasingly impulsive business travel plans on short notice. “We see a lot more last-minute bookings,” says René Beauchamp, general manager at the Four Seasons Hotel. Marie Jehličková, whose firm, Intercontact, organizes business trips, as well as incentive trips and congress travel, says the business is now a 24-hour-a-day job. “Sometimes bookings are a matter of hours,” she says. One reason why is that firms hope to avoid possible cancellation fees. “International companies are very cautious now,” Platzer says, “so we’re becoming more flexible.” Some hotels, like Hilton, are adjusting in other ways. “We outsource more,” Zerunyan notes, referring specifically to cleaning services and events staff. Prices, however, haven’t become flexible – in spite of the worldwide trend of firms trying to hold down costs. “The travel and entertaining budget is always the first to be reduced,” says Jana Martincová, head of travel operations at American Express. 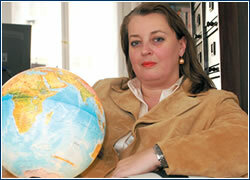 Her department focuses on business travel and has about 250 (mostly international) companies as clients. Daniela Nová, head of sales for Accor Hotels, which runs six hotels in the country from the 3-star Ibis hotels to 4-star Mercure, Novotel and Dorint hotels, says some companies are moving to lower-starred hotels as a result. “More and more business travelers are going for 3-star hotels,” she shares. Nová also finds more visitors arriving in the morning, renting a conference room for the day, then leaving at night. Similarly, there are more Czech visitors, traveling from out of Prague, who are returning home after a day of meetings at the hotel instead of staying the night. Air travel is, of course, where cost-saving is most visible, and Martincová says that American Express now options budget airlines for its clients. Traditional airlines are feeling the crunch from low-cost carriers. “Fares have been decreasing in the last few years,” says Michaela Drahoňovská, on-leave director of British Airways in the Czech Republic. But she says many business travelers – especially those who travel frequently – are returning after trying out budget airlines. To draw them back, airlines continue focusing on incentives like frequent flyer programs, as well introducing services to make business travelers’ lives easier – during the flight and before. For example, Pos says ČSA, to help save corporate passengers’ time, hopes to one day allow them check-in in the business lounge (as well as online, which is being tested now), and wants to see a window for “priority” passengers at passport controls – although both are in negotiations with immigration police. General business travel, of course, will always be a strong and stable source of hotel and airline revenues. However, convention tourism remains an area not fully exploited. Positives are there, something as simple as the increased number of rooms and hotels, says Bettina Freudenthaler, managing director of Liberty Incentives & Congresses. While the numbers have been rising – 580,000 congress visitors spent CZK 12.5 billion last year, an increase of 13% year-on-year – the complaint that not enough is being done lingers. “There are too many conflicting areas of interest,” complains Klaus Pilz, general manager of the Crowne Plaza in Prague, referring to the number of organizations, like Czech Tourism or the Convention Bureau (Pražská asociace kongresové turistiky – PAKT), which promote the country. Others agree, and last year a white paper on convention tourism was completed, bringing together various tourist organizations, like PAKT and the National Federation of Hotels and Restaurants, Prague City Hall and the Ministry for Regional Development, as well as KPMG and the American Chamber of Commerce (AmCham). The paper made three main recommendations. “First, marketing, and its implementation, should be more centralized,” says Weston Stacey, director at AmCham, preferring an organization modeled like the Vienna Convention Bureau. Second and thirdly, the group should be staffed by marketing experts with tourism experience, and funds of between EUR 20-30 million need to be raised, a third of which will be used for promotion of next year’s meeting of the American Society of Travel Agents (ASTA), the olympiad of conventions, which could potentially bring 3,000 travel agencies to Prague. PAKT is taking a leading role in implementing the white paper and organizing the ASTA conference, which it had helped to secure along with other groups. “Promotion of Prague as a congress destination is our main strategy,” says Michael Hvížďala, chairman of PAKT. Among its promotions is a billboard campaign that’s been running a couple of years in the 10 largest German cities, as well as workshops and international exhibitions around Europe, and it will soon start marketing campaigns in Scandinavia. Hvížďala also concedes more needs to be done. “It’s essential to still improve and intensify the promotion of Prague and the whole country abroad,” he says. He also understands the value of word-of-mouth advertising and hopes ASTA will play a part in this. Players in the travel industry have cause to remain optimistic about the future. Prague’s reputation in regard to service is improving, and the number of historical sites in the country is a consistent draw for all types of travelers. Long-term events like festivals and conventions, combined with location-shoots in the film industry have established an extended-stay market, and the increasing number of visitors combining work and travel is reflected in the success of the region’s growing number of golf courses. One thing that worries tourism experts is the possibility of VAT shooting up to 19% next year. Tourist organizations are not alone in their concern that this could have far-reaching effects on the amount of visitors, and consequently on labor, as tourism is one of the nation’s biggest employers. After successfully negotiating for the 5% rate to be maintained this year, PAKT is stepping up efforts to get that figure ratified for next year, and years to come. “Higher rates would decrease the amount of foreign visitors,” Hvížďala argues, pointing out that convention-goers spend about CZK 6,000 daily, roughly twice as much as leisure travelers. Used as a way to impress a client or save some time, more time-crunched executives are opting for private aircraft or charter flights to get from point A to B. The Czech Airports Authority (ČSL) recorded an 11% jump year-on-year in private takeoffs and landings in the third quarter last year (the latest figures available). Overall flights were expected to top 13,500 in 2004 – although it must be noted the majority of flights have been made by foreign planes. More proof of its growing popularity is in the fact that the third quarter saw 4,095 private flights compared to 2,555 in the first quarter, according to ČSL. Martin Pražský, co-founder and managing director of Time Air, sees this momentum building. “This time (January) last year, business was very dead,” he says, adding that business is cyclical. “This January we’ve seen quite a lot of business, though.” Time Air, which is an aircraft management firm that also charters private aircraft, started in 2001 and has built a clientele made up of predominantly entrepreneurs who own medium-sized enterprises in production and services. The reason? Pražský says it makes things much easier when picking up clients (most often from abroad) being taken to remote production sites. “It’s also an ice breaker and gets you closer to clients,” he adds. New amenities, more space At Ruzyně Airport life is getting easier for the ever important short-term business traveler. A second hotel – Hotel Tranzit – was opened in May, the same month plans for a third hotel were announced by developer ECM. Just as well, last May saw the opening of ČSA’s renovated business lounge. More importantly, construction of a new terminal is moving along to its expected finish in December this year. The new terminal, which will handle all EU flights, will boost airport capacity to 10 million annual passengers in the first stage, with numbers eventually reaching 17 million. The Czech Airport Authority (ČSL) and ČSA are betting the terminal will boost Prague’s position as a major junction. “We want to build Prague as a major hub,” says Jří Pos, vice-president for ground operations at ČSA. However, Prague still has a fierce rivalry with Vienna and Munich, and long-haul traffic to Prague is minimal, hurting passenger numbers. “Long-haul operations will bring even more transfer visitors (currently 40% of ČSA passengers),” Pos says. Which turns discussions back to development around the airport. The four-star Hotel Tranzit opened last May and offers 70 rooms and two suites. Also near the airport is the 56-room Ramada Airport Hotel, opened in June 2003. Besides those passengers who’ve missed flights, both hotels cater to time-pressed business travelers, offering in-room internet connections and meeting facilities. Accommodation will get a real push when a new hotel – which will be operated by a yet unknown international chain – opens toward the end of 2006. The planned 3-4 star hotel should add 220 rooms, as well as convention space for up to 250 people. Moreover, the hotel will feature 3,000 square meters of badly needed retail space, which the new terminal will also contain. Similarly, ČSA’s new business lounge (designed by Bořek Šípek, no less) has been available to travelers since May. The 500-square-meter space seats 170 and now offers more privacy and choice than the previous lounge. “We structured the space into different areas based on different moods,” Pos explains, pointing to a business center with internet connections (although not wireless, yet), a cafeteria/bar for conversation, and a quieter area to relax, with a nice view of the runway – possibly raising the risk of missing your flight.